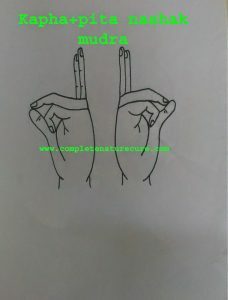 Mudras are simple yet, one of the most effective ways of treatments. 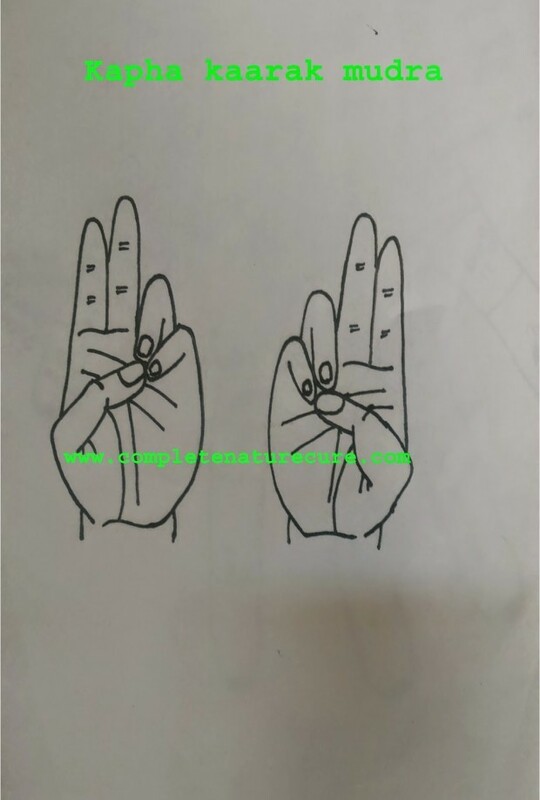 One does not need any specifications or requirements to perform mudras. 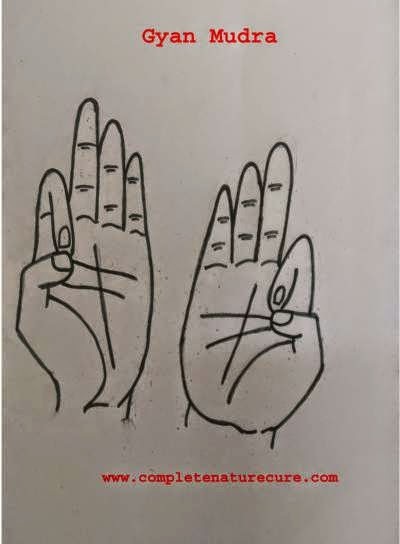 Any person can perform mudras in accordance with the constitutions or humor to enhance health and treat diseases. Many mudras help in treating almost every mild and chronic disorder. However, in this article, there are 25 major mudras that help in treating the major physical and psychological disorders. Vaayu Vardhak mudra enriches air element in the body. It helps in overcoming and balancing Vata deficiency. It is the main component of humor Vata. 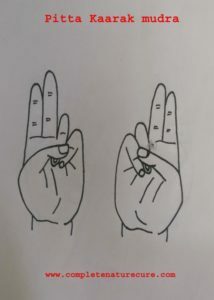 This mudra is formed by joining tip of index and thumb finger. It can be practiced for 45 minutes in a day in one or three sittings. The ideal time to practice is between 2 am to 6 pm . All the mudras are practiced in cross-legged sitting posture. Vairaagya mudra – Both the hands in mudra position on the laps. Puran Gyan mudra – Right hand in mudra position near the chest and left hand on the lap. Abhay Gyan mudra – Both the hands in mudra position on the either side shoulders. 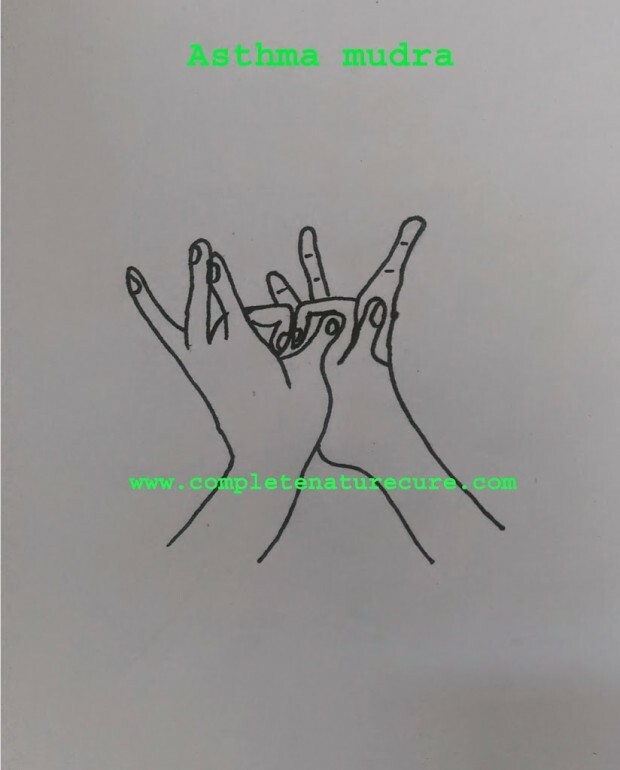 Dhyaan Gyan mudra – Both the hands in mudra position near the pelvic region. Empowers nervous system and mind. Enhances voluntary and involuntary muscles. Improves skin and mucous membranes. Facilities proper functioning of joints and articular cartilage. Respiratory disorders, especially in treating excessive mucous. Optic atrophy and retinal degeneration. 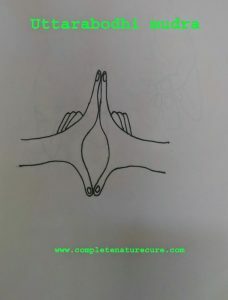 Vaayu mudra helps in decreasing air element in the body. It does by suppressing air element by fire element. It is also the main component of humor Vata. It is most suitable for people with Vata dosha. This mudra is formed by gently placing the thumb finger over the index finger. Tip of index finger should touch the base of thumb finger. Brings relaxation to anxious mind. Rehydrates skin and articular cartilage. Nystagmus and twitching of eyelids. Cramps, spasms and rigidity in muscles. 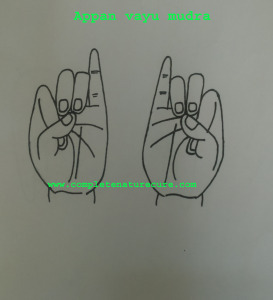 Aakaash mudra increases space element in the body. It helps in reuniting with higher consciousness. It plays a major role in the increase of the other bodily elements like air, water, fire and earth. Hence, it is the best way to increase all the bodily elements. This mudra is formed by joining tips of middle and thumb fingers. Replaces negative emotions with positive thoughts. Elevates and brings nobility to thoughts. Increases the power of intuition. Detoxifies the body by eliminating toxic wastes. Helps in overcoming discomfort resulting from excess eating. Fights heaviness in the body. Relieves from congestion in head, ear, and chest. Fights hypertension, angina pectoris, and irregular heartbeats. Shoonya mudra helps in suppressing space element using fire element. It is also a component of humor Vata. It can be combined with Jal-Shaamak, Agni Shaamak, Vaayu Shaamak and Prithvi Shaamak mudras. This mudra is formed by gently placing the thumb finger over the middle finger. Middle finger should touch the base of thumb finger. Helps in treating abnormalities caused by space element. Restricts air, fire, water and earth elements. Helps in treating numbness in the body, especially in the head, abdomen, and chest. Alleviates pain from ear ailments like tinnitus, vertigo and acquired deafness. Prithvi mudra increases earth element and decreases the fire element in the body. It is a component of bodily pitta humor. Prithvi mudra is formed by joining tips of ring and thumb fingers. The main component of body tissues like skin, hair, flesh, nails, muscles, tendons, internal organs, bones and cartilage. Associated with the nose, hence treats most of the nasal disorders. Pacifies fire element in the body. Prithvi mudra helps in treating the following disorders. Hair loss and premature graying of hair. Ulcers in the mouth, stomach and intestine. 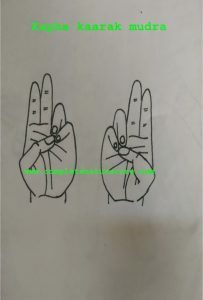 Surya mudra increases air element and decreases Prithvi element. Surya mudra: Gently placing the thumb finger over ring finger. Tip of ring finger touching the base of thumb finger. Maintains body temperature and metabolism. Helps in overcoming pitta deficiency and related diseases. Indigestion, loss of appetite and constipation. The low or complete absence of sweating. Varun mudra increases water element in the body, which constitutes about 70% of the body. 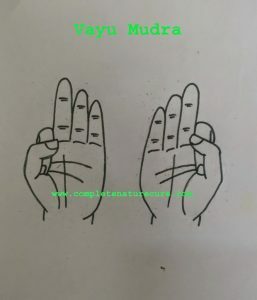 Varun mudra: Join tips of the thumb and little finger. Increases water content in the body. Associated with taste and tongue. Maintains water balance in all the cells, fluids and tissues. Dryness of digestive tract and eyes. 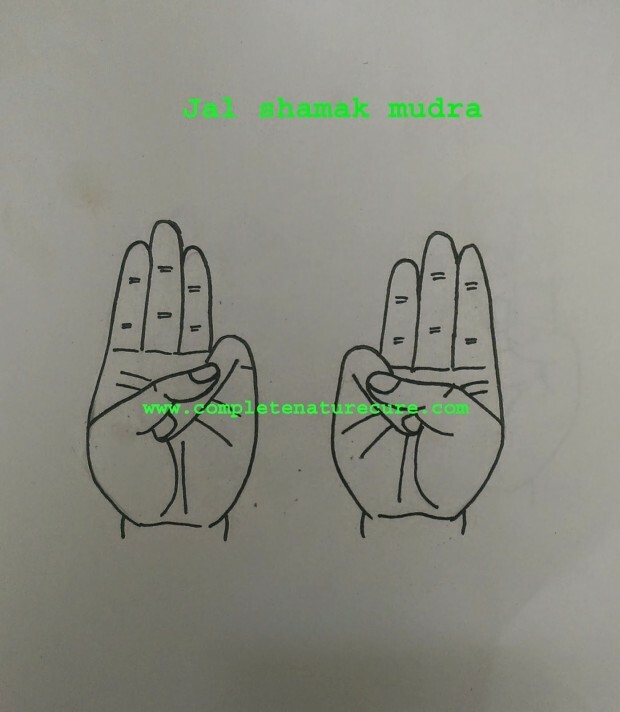 Jal-Shaamak mudra reduces water element in the body. Jal-Shaamak mudra: Gently place thumb finger over the little finger. Tip of the little finger touching the base of thumb finger. Reduces water content in the body. Beneficial to people with pronounced pitta-Kapha constitution. Running nose and watery eyes. 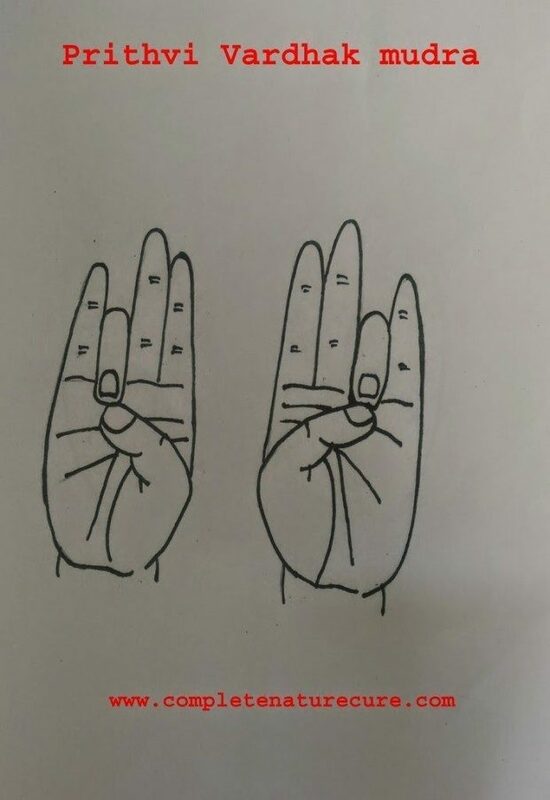 Vaayan mudra increases Vata humor in the body. 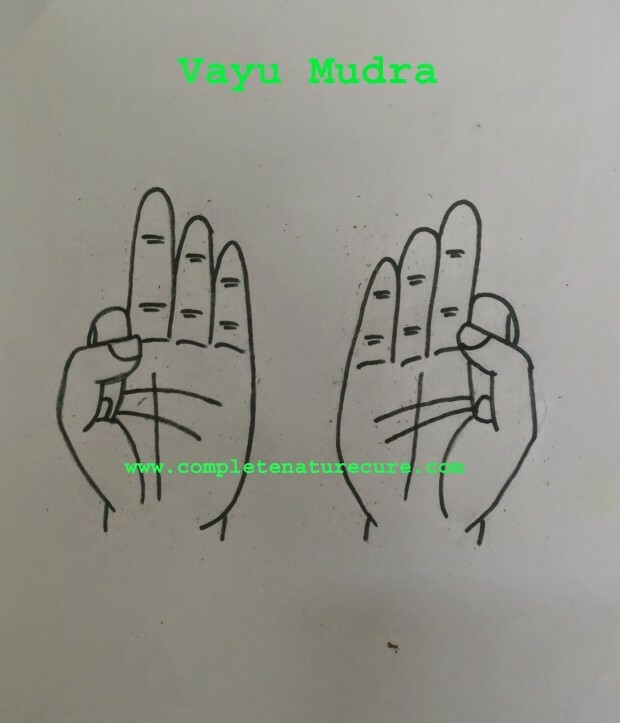 Vaayan mudra: Join tips of thumb, index, and middle fingers. 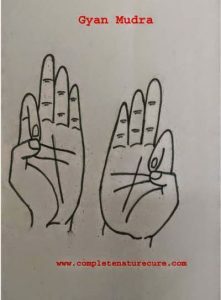 Udaan mudra: Joining tips of middle finger and thumb finger and placing the tip of index finger over the nail of the middle finger. 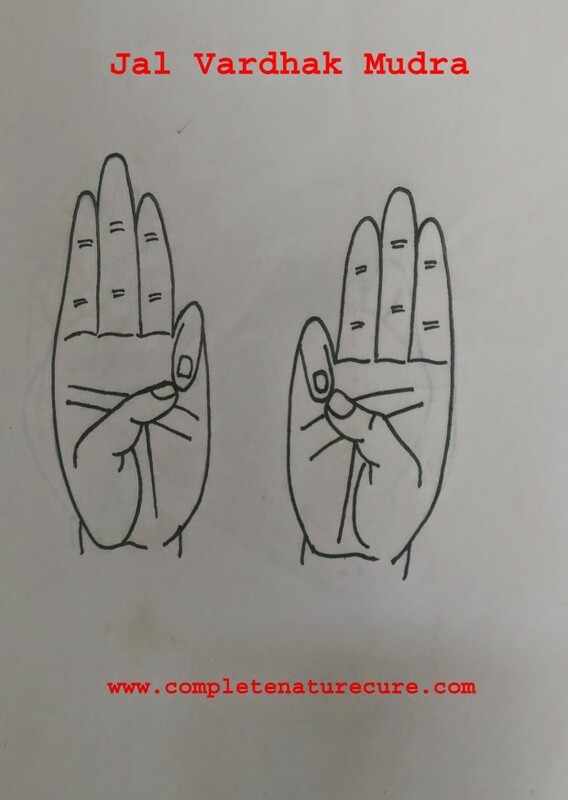 This mudra helps in enhancing vocal cords, respiratory system, and blood circulation. Vyaan mudra: Placing the tip of index finger over the nail of thumb finger and the tip of the middle finger over index finger’s nail. 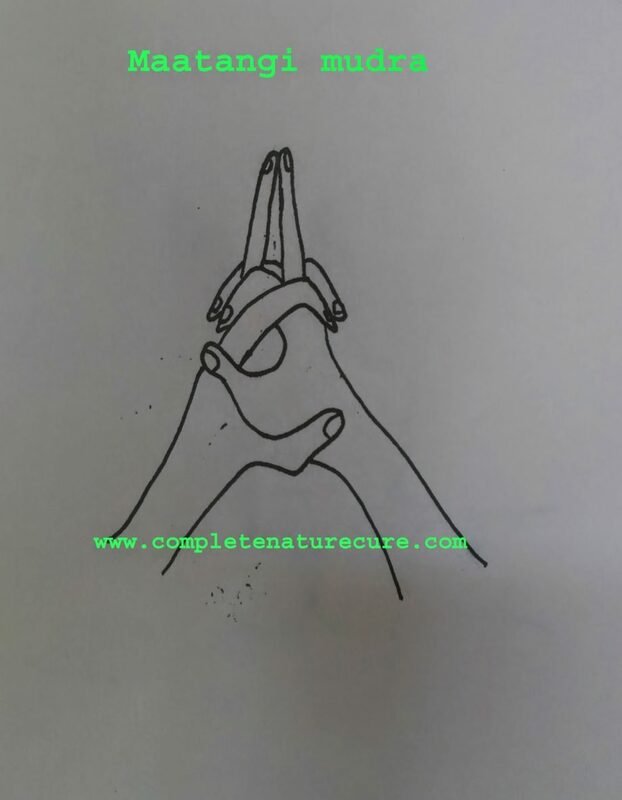 This mudra helps in ailment blood circulation and heart. Helps in overcoming Vata deficiency and related diseases. Slow perception and low enthusiasm. Sunstroke and intolerance of heat. 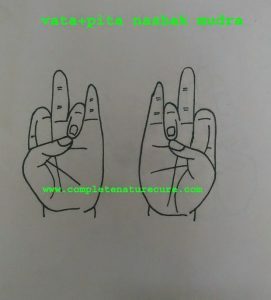 Vaata Naashak mudra reduces Vata humor in the body. Vaata-Naashak mudra: Place tips of the index and middle finger at the base of the thumb. Gently place the thumb over the middle and index fingers. Beneficial for pronounced Vata dosha. Weight loss or low weight problems. Parkinsonism, giddiness, unsteady gait and vertigo. Painful, scanty and irregular menses. Intolerance of cold wind or weather. Stammering or hoarseness in the voice. 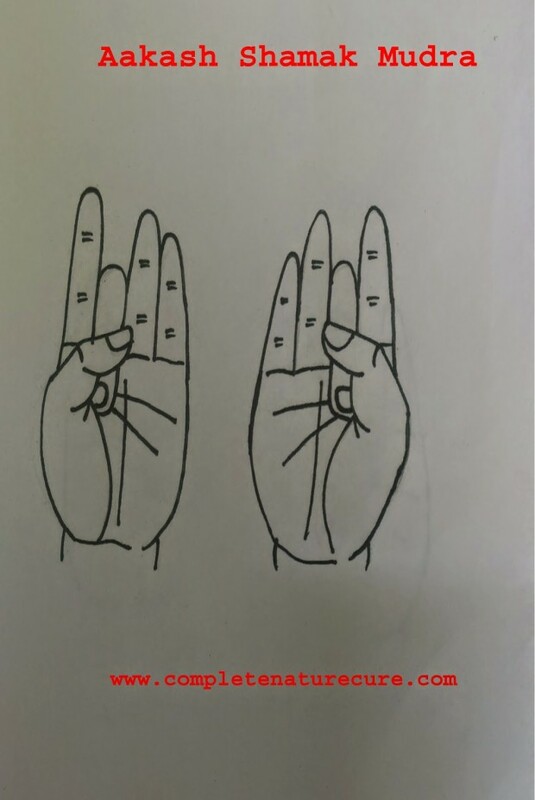 Pitta-Kaarak mudra increases pitta humor in the body. It also helps in reducing Kapha humor. Pitta-Kaarak mudra: Place ring and little finger at the base of thumb finger. Gently place thumb finger over the thumb of those two fingers. Maintains and regulates bodily heat. Plays a major role in regulating digestion, metabolism, and circulatory system. Excess mucus in digestive and respiratory system. Greasy or oily skin or hair. 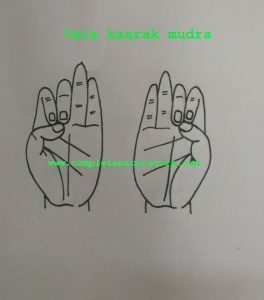 Praan mudra increases Kapha humor and decreases Pitta humor. 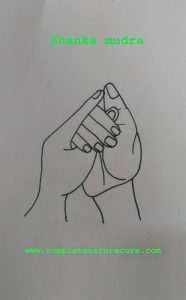 Praan mudra: Join the tips of thumb, ring, and little fingers. 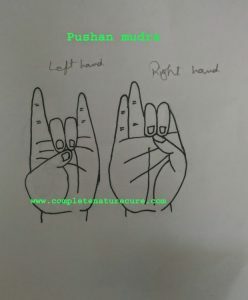 Praan mudra helps in fighting the following disorders. Low endurance, debility, and fatigue. Ulcers or burning sensation in the mouth, throat and stomach. Skin rashes, leprosy and urticarial. Inflammatory disorders, especially the disorders with it is ending. Graying, drying and sparse hair. 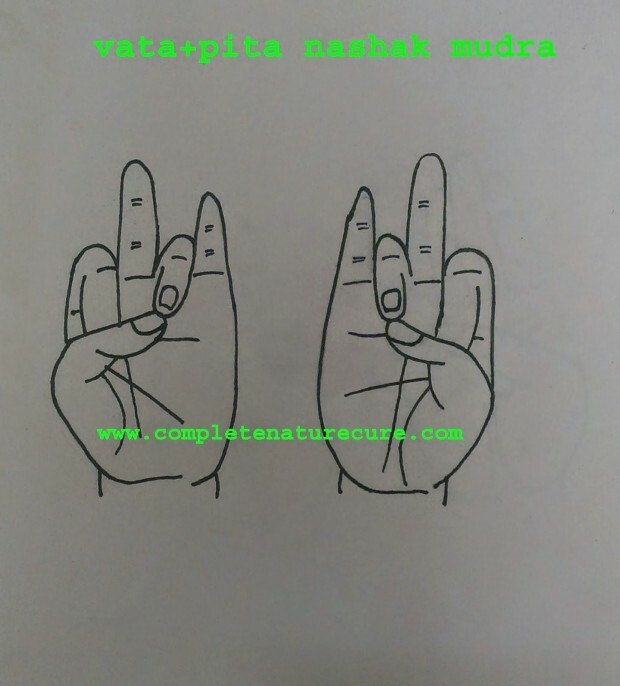 Vaata Pitta-Naashak mudra helps in treating the persons with disorders related to Vaata Pitta mix constitution. 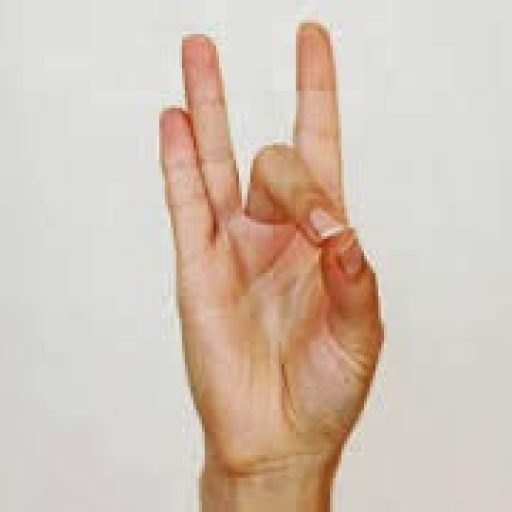 Vaata Pitta-Naashak mudra: Join tips of thumb and ring finger with the tip of index finger at the base of thumb finger. Vaata Kapha-Naashak mudra helps in overcoming diseases related to Vaata Kapha mix constitution. Vaata Kapha-Naashak mudra: Place tips of index and ring finger at the base of thumb finger. Gently place the thumb finger over the bent index and ring fingers. 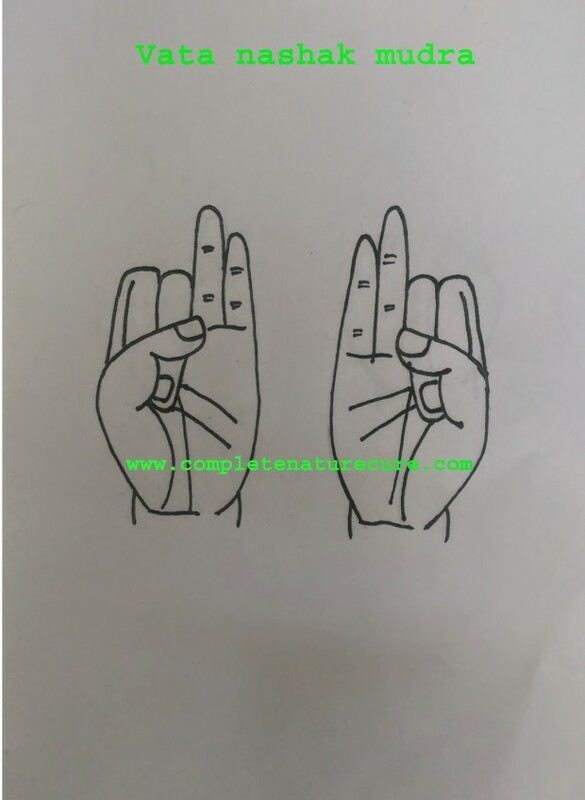 Pitta-Kapha Naashak mudra helps in treating the diseases related to Pitta Kapha mix constitution. Pitta-Kapha Naashak mudra: Join tips of ring and thumb fingers with the tip of the little finger at the base of thumb finger. 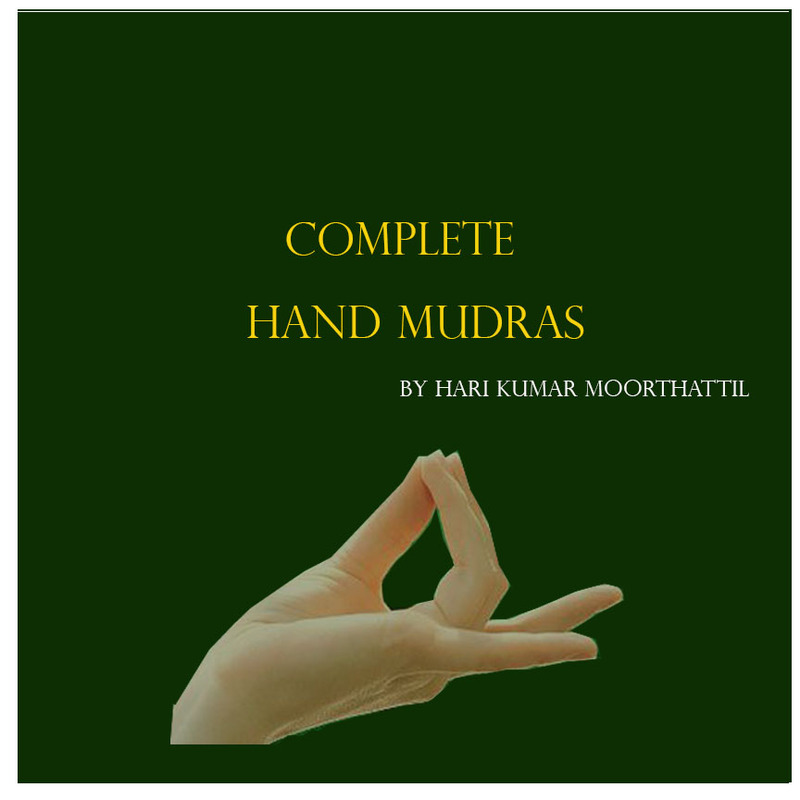 Mukul mudra balances and enhances the functioning of all the three humors and five elements in the body. This mudra treats almost every disorder. Mukul mudra: Join the tips of all the five fingers. 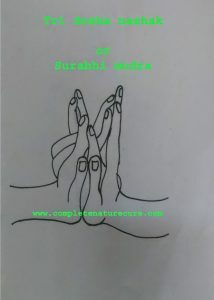 Directing or touching Mukul mudra pose to the diseases part of body enhances the healing effect. Kaamadhenu is a mythological and heavenly cow, which is known to grant and fulfill all the wishes. 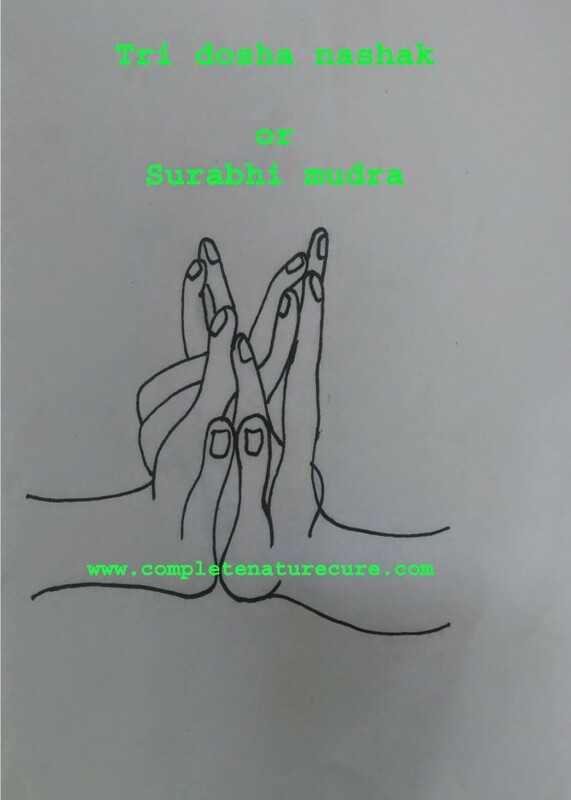 This mudra also balances and enhances the functioning of all the three humors and five elements in the body. 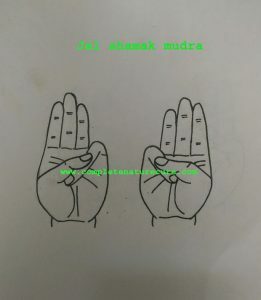 Kaamadhenu mudra: Join tips of the little finger of one hand to the ring finger of the other hand. Join tips of the index finger of one hand to the middle finger of the other. Two thumbs must touch each other on sides. This mudra represents four udders of a cow. 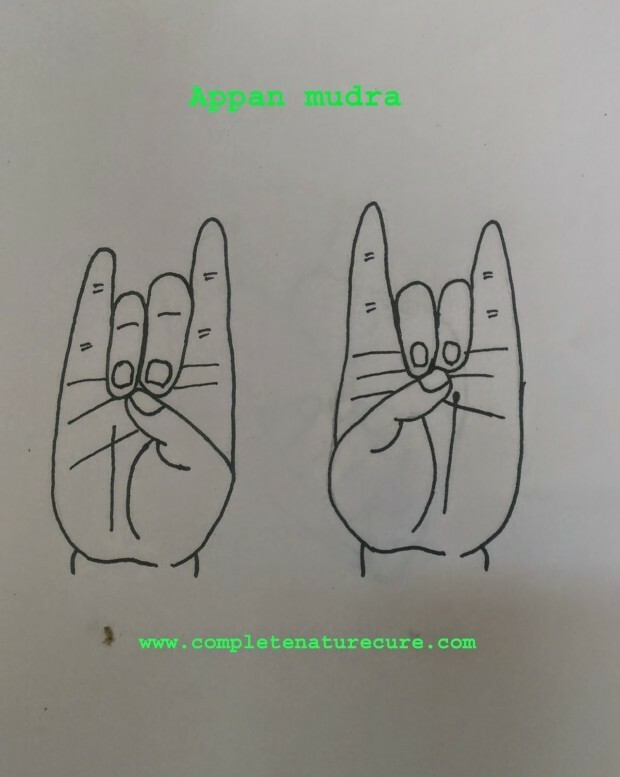 Apaan mudra is one of the most beneficial mudras in detoxifying, thereupon purifying and energizing the body. It increases space and earth elements in the body. 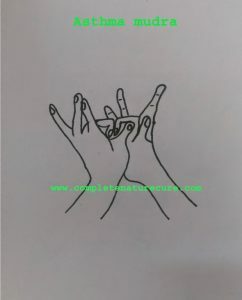 Apaan mudra: Join tips of middle, ring and thumb finger. This mudra is a combination of Prithvi-Vardhak and Aakaash-Vardhak mudra. It enriches Vaata and Kapha humors in the body and decreases Pitta humor. Delay in delivery of the child. Burning sensation or burning of body parts. 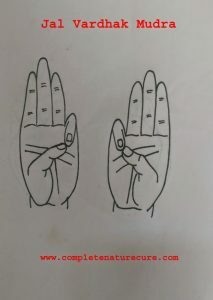 Vaata-Kapha mix people should practice this mudra in moderation. Apaan-Vaayu mudra increases the earth element and decreases air and fire elements in the body. This mudra benefits and pulls the person away from the deadly pains in chest or heart attack. 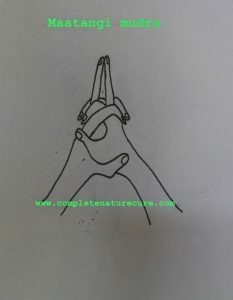 Apaan-Vaayu mudra: Join tips of the ring, middle and thumb fingers. Place the tip of index finger at the base of the thumb. Removes blockages and detoxify the body. Sedates and relaxes the mind and body. Body, tooth and joint pains. 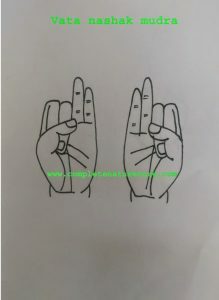 When the person with heart attack symptoms performs this mudra, it helps in relaxation and minimizing the damage to heart muscles. 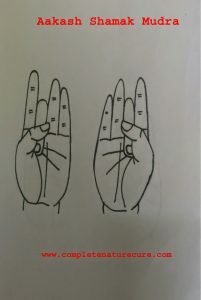 People with pronounced Kapha should practice this mudra in moderation. Linga is a Sanskrit word, meaning Phallus. It increases heat and reinforces Pitta humor and fire element. Linga mudra: Interlock the thumbs, and erect the left thumb pointing skywards. Asthma and other respiratory disorders. Sexual debility, especially in males. Cold, sinusitis, wet cough, and sticky stools. Shivering or intolerant towards cold. 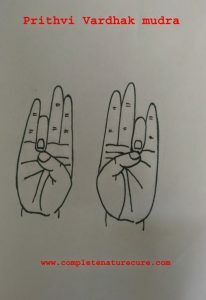 One shall perform Linga mudra only during the above mentioned and related diseases. Over practice of Linga mudra causes lethargy and sluggishness. Should not perform during excess Pitta ailments like a fever. Shanka is an Indian word meaning conch. It increases air element , Vaata and Kapha humors in the body. Shanka mudra also decreases the Pitta humor in the body. Shanka mudra: Grasp the left thumb with fingers of right hand. Place the fingers of left hand on the back of the right palm. Join tips of the index finger of left hand and thumb finger of right hand. Shankha mudra helps in fighting the following disorders. The weakness of muscles or paralysis. People with Vaata Kapha constitution shall practice Shankha mudra in moderation. In addition, there is another form of Shankha mudra. It is known as Sahaj Shankha mudra which has same benefits of Shankha mudra. 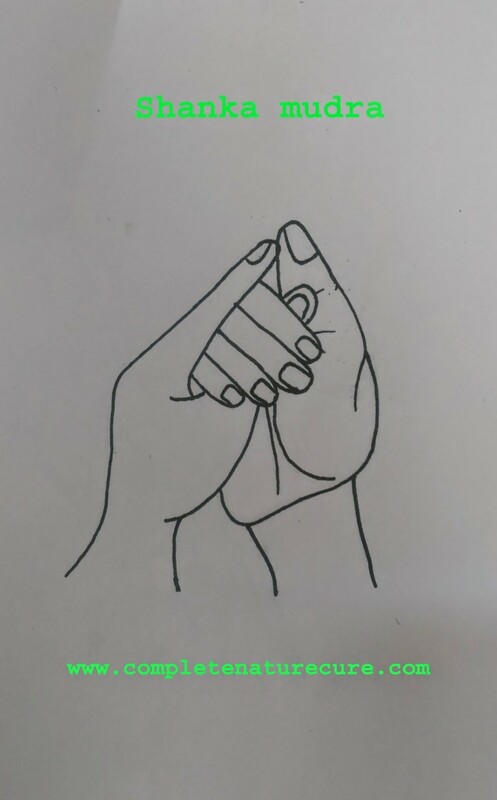 Sahaj Shankha mudra: Interlock eight fingers of both hands and with thumb fingers in contact with each other facing skywards. 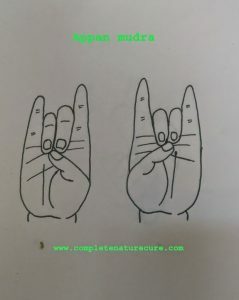 Asthma mudra helps asthmatics, similar to those of Surya, Aakaash or Linga mudras. Asthma mudra: Press the fingernails of the middle finger of one hand to the other. Gently extend the other fingers outward. Relaxes the muscles of the respiratory tract. Treats and also prevents from Asthma. Matangi is considered as God of inner harmony. It helps a person in attaining harmony with the self and surroundings. Matangi mudra: Interlock both the hands and hold it at the navel. Erect the middle fingers touching each other skywards. Enhances the functioning of the hypothalamus. Brings state of balance in the body. Alleviates pain from chest and abdomen. Uttarabhodhi mudra dawns enlightenment and dispels fear. Uttarabhodhi mudra: Interlock both the hands at the level of the navel. Keep the index fingers straight touching each other and pointing skywards. In the same way, touch the thumb fingers keeping straight and pointing downwards. Brings realization of fear no one except the almighty. Soothes nervous system during or before the daunting task. Helps in overcoming nervousness, stage fright and related stress disorders. Pushaan mudra or sun represents God of warmth, nourishment, and energy. 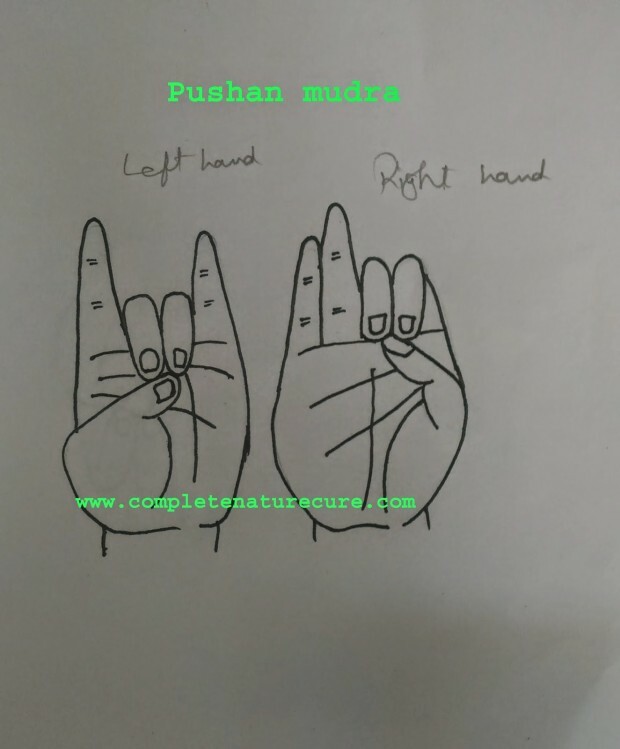 Pushaan mudra: Position right hand in Vaata Kaarak mudra and left hand in the position of Apaan mudra. Improves stamina, endurance, and strength. All the mudras except the Linga mudra can be practiced for 45 minutes in a day. It can be parted into 3 sessions of 15 minutes each. In the current world, we do our best in keeping both our physical and psychological aspects healthy. We take care of our diet and practice different exercise. Bue due to some or the internal and external conditions are body fails to optimize the benefits. Mudras are the perfect tools to enhance all the benefits. Mudras optimize the benefits by helping our body function in accordance with the exercise, diet, and environmental conditions. One can practice mudras anywhere. Either while you are watching TV, reading books or sitting idle. Practicing mudras during meditation take the meditation to the next level. One thing is that mudras help the body and mind in attaining balance and control over all the three aspects of yourself. They are physical, psychological and spiritual level. Start practicing it today, you may not see the benefits right away, but you will see the improvements along the path.